A review of The Samling Michelin Star Restaurant in the Lake District. Ups: Decadent, artistic, exotic and delicious. Downs: Canapés lacking, dining room too small. The Samling is a hotel featuring a Michelin star restaurant and 67 acres of land overlooking Lake Windemere. There are five suites in the main house and six cottage suites close by. There’s also the semi-legendary hot tub, although we didn’t partake. We attended the adult-only restaurant and ordered from the à la carte menu although there are tasting menus available at a higher price. 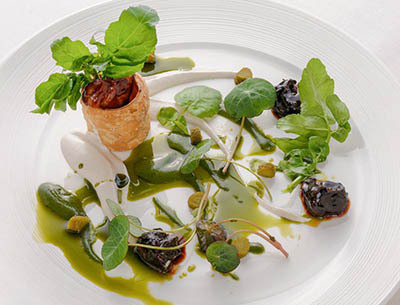 The menu is wholeheartedly and unapologeticly experimental fine dining. Do not be surprised if you read that a dish should be served by ballerinas or shot through a cannon. It’s theatre and you must leave scepticism at the door if you want to get the most from it. We were delicately placed in a holding room and a host commented that we had requested a special menu. I had mentioned in advance that my wife is a pescatarian and, while there appeared to be enough on the main menu to cater for such tastes, they had still taken the time to prepare an alternate set of canapés for her. The waiter was fast talking and heavily accented. I didn’t catch either the name or the ingredients of the canapés despite asking twice. They were served on tiny spoons which had green blobs on them. Emma and I looked apprehensively at each other. I’m not sure what we ate. I’m not sure I would eat it again. Still, tonight was a night of experimentation and being brave. We strode onwards. 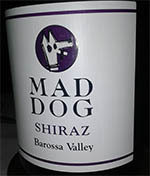 We ordered a bottle of Australian vineyard Mad Dog’s Barossa Valley Shiraz. I don’t think I’ve ever drank such a smooth, cherry heavy wine in my life. Looking for a Christmas present for me? Look no further. The thing about the à la carte menu is that your order three courses, but you don’t get three courses. You get about seven. Between each course is a pre-course of the chef’s choosing. The canapés, a selection of artisan breads, and a genie’s lamp. Stay tuned for that. Emma’s starter was the Goats Cheese Roulade with truffle, honey & celery . The cheese was sharp and covered in nuts. The sweet honey complimented it well. I went out on more of a limb. When you choose to call a starter ‘Snail Trail’, you have to expect a few raised eyebrows. Snail, as an ingredient, is contentious enough in the UK without reminding customers that it exudes silvery mucus wherever it goes. Don’t worry, though. The dish contains (deep breath) veal sweetbreads served in a bone marrow, red wine braised snails, watercress, garlic puree and horseradish snow. There may well be an alternate universe where snow falls from the sky, flavoured with horseradish. Perhaps this Narnian wonderland is accessible from the Samling’s kitchen. There’s certainly something other-worldly about the food, the dining rooms. We were in a small room with only two other tables, sat next to an old, unlit fireplace. It felt a little peculiar being in a restaurant, but being in a room the same size as a domestic dining room. This was my first time eating snails and I would order them again in a heartbeat. Rich, dark and chewy treats to accompany the equally decadent sweetbread/marrow crunch. Our neighbors were slightly ahead of us and were being served from the “Cheese Chariot”, which fairly stank out the wee room. Now, we love cheese and we love smelly cheese, but even the most avid blue cheese fan would have had to admit that such a small room and such a strong smell was not a good combination when there were other people not eating cheese at that time. Emma’s main, Risotto of Truffle and Parmesan with textures of artichoke, came heavily seasoned with onion ash. As a dish, it worked although the ash was incredibly bitter. I ordered the venison and received what Paul & Mary would call a showstopper. Roasted Loin, served with Walnuts, Chestnuts, Truffle Maderia Jus and Kale. But there was something else. Something dry, brittle and pale at the end of my plate atop a shaving of truffle. I asked again what this was, and was told. Swedish moss. It was a triumph, a celebration of flavours. I wanted to punch the air at the Swedish moss. It was moss, from Sweden, apparently. At some point, somebody had created this dish and stopped to stroke their chin and wonder what else was required. They had reached down and somehow had the knowledge of the existence of a moss in a small Nordic country that would compliment everything else perfectly. And they were right. Rich, decadent, meaty and fun. We were treated to another impromptu course, a pre-dessert Apple Crumble. This was not Granny’s crumble. This was theatre. The waiter brought a clear glass genie’s lantern and had us wait while he poured dry ice into it. Once steaming, he served home-made granola, sorbet and a small, plastic apple with apple sauce inside it. Tasty. Dessert proper was a Dehydrated Muscovado Sponge Cake, Soaked in a Lime and Malibu Syrup with Coconut, Honeycomb and Coffee for me. It was bursting with every flavour that it promised, although the wine was working well by that point. Emma ordered the simply titled Chocolate and Hazelnut which had special guests amaretto, frangelico & Baileys. The alcohol content dominated the flavour, but not in a bad way. It was a chocolately cocktail, which is a fine way to round off the evening. Photos from Samling website & Facebook page. Previous Article I'm Going to Lose My #DadBelly. Honest. Camping with kids. A new experience!